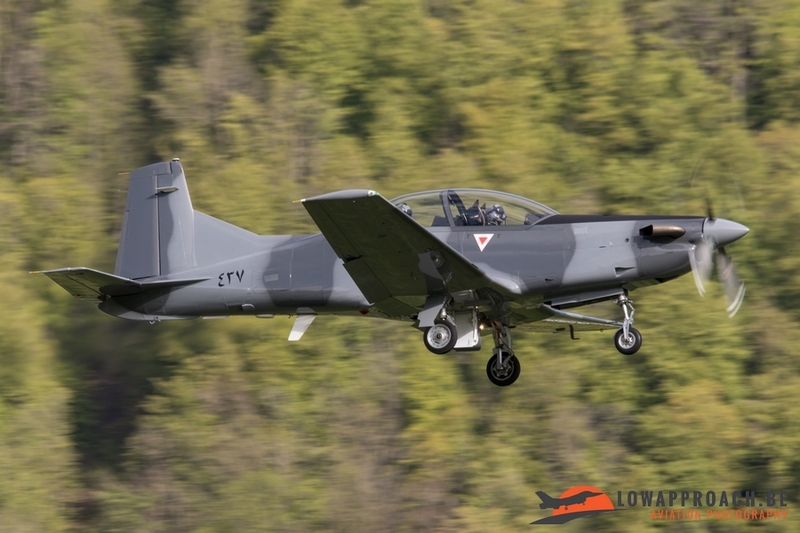 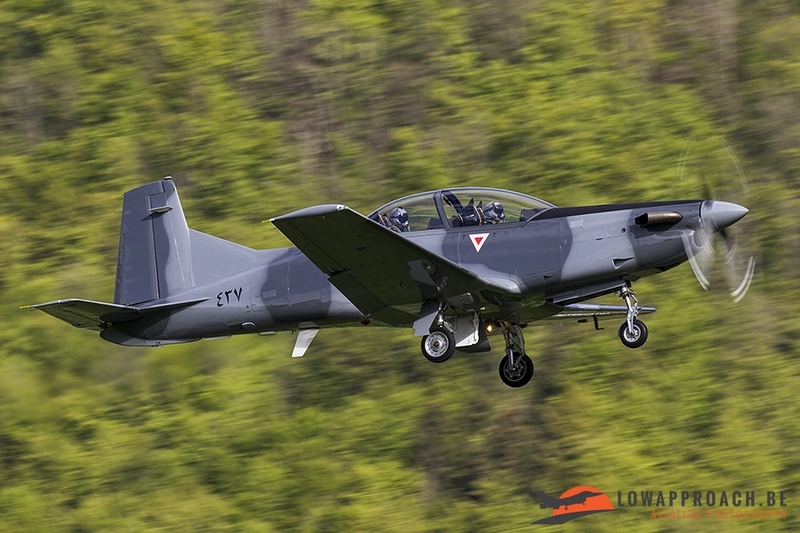 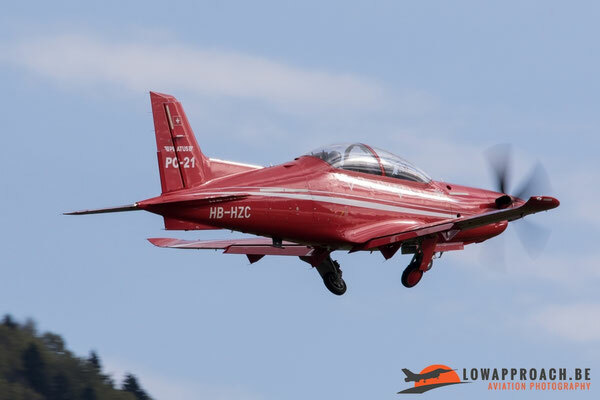 The last report of our trip to Switzerland is about our visits to the airfields of Alpnach and Buochs-Stans. 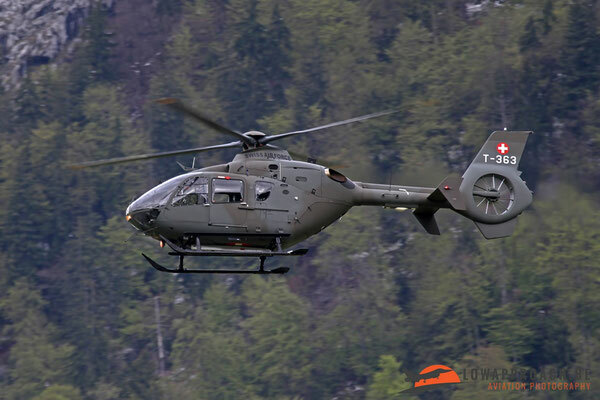 During the week we traveled to Alpnach one time to see what happened over there. 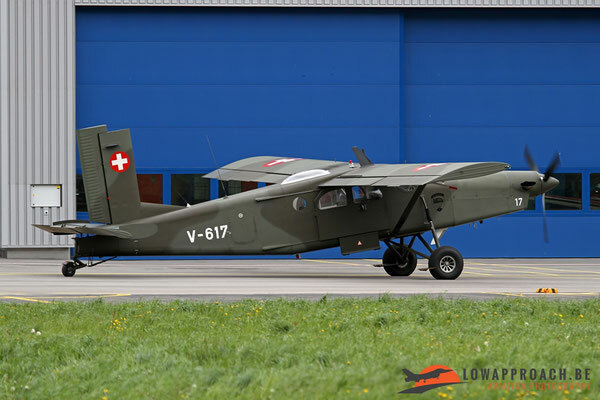 Alpnach Air Base is a Swiss Air Force airfield near the town Alpnach in Canton of Obwalden. 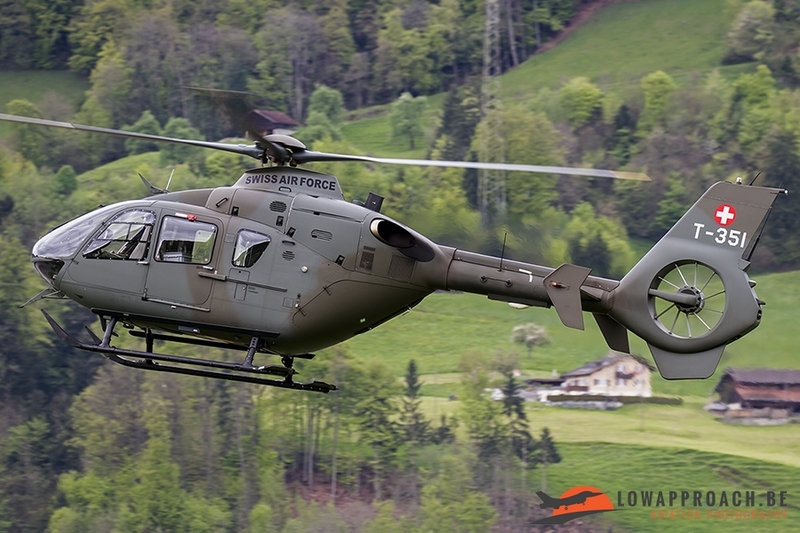 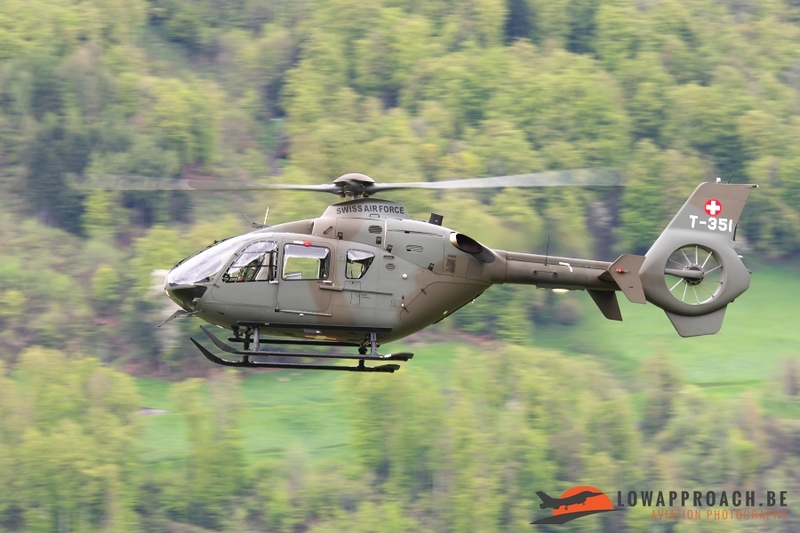 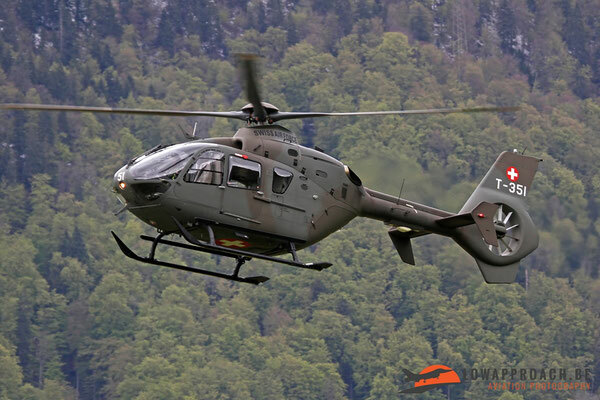 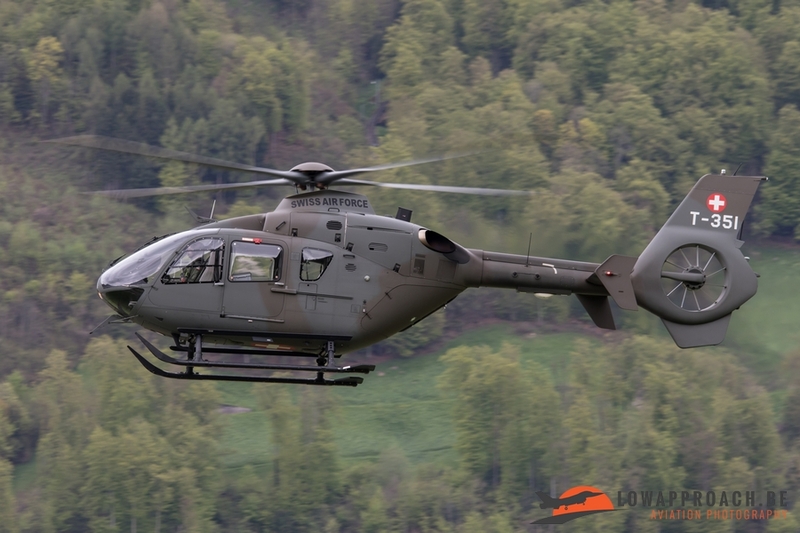 Alpnach is the main logistical base of the helicopter of the Swiss Air Force. 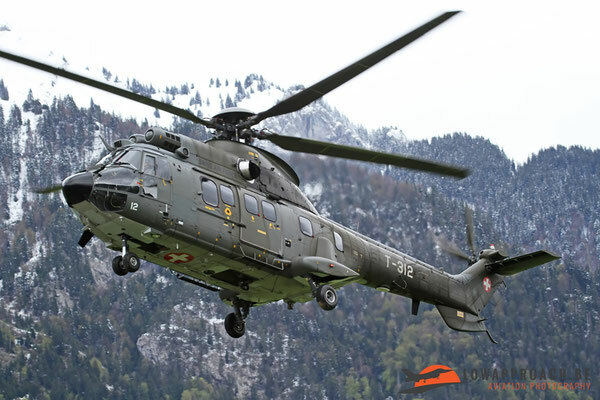 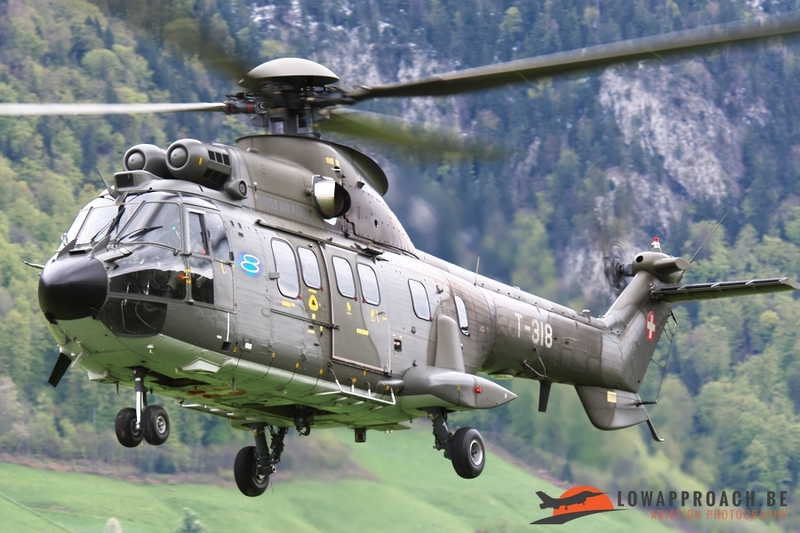 Standard helicopter types used at Air Base Alpnach are the Aérospatiale Super Puma, Eurocopter AS532UL Cougar Mk1 and Eurocopter EC-635. The RUAG Switzerland AG operates on the airfield a location for the maintenance of civil and military helicopters. 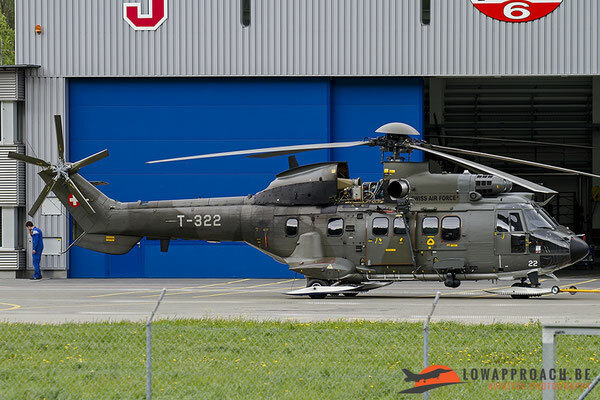 During our short visit to Alpnach (2 hours) we have seen some activity from all based helicopters, when we arrived at the base already a EC635 was starting up and a Super Puma was performing engine tests. 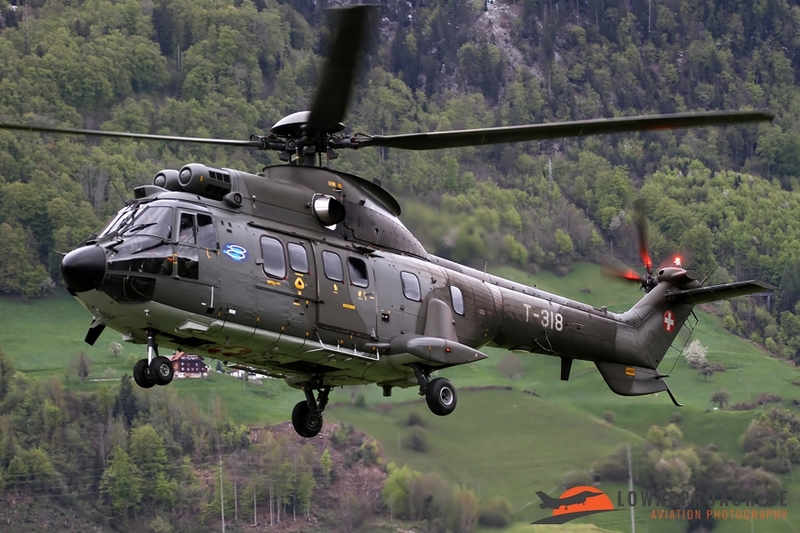 A nice extra for us was the Super Puma was wearing ski’s, they are attached to allow landing on snow. 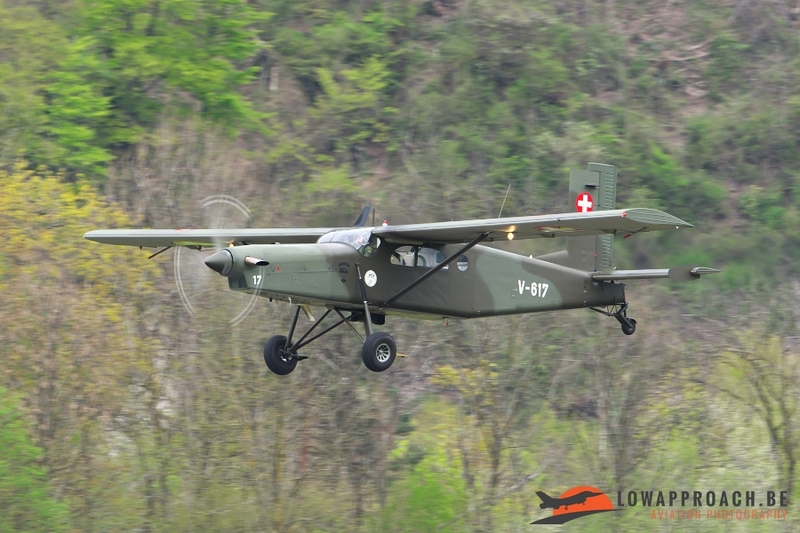 A Pilatus PC-6 was making touch and go’s in the meanwhile and afterwards it landed back in Alpnach. Now the silence returned at Alpnach, after half an hour we heard something…. 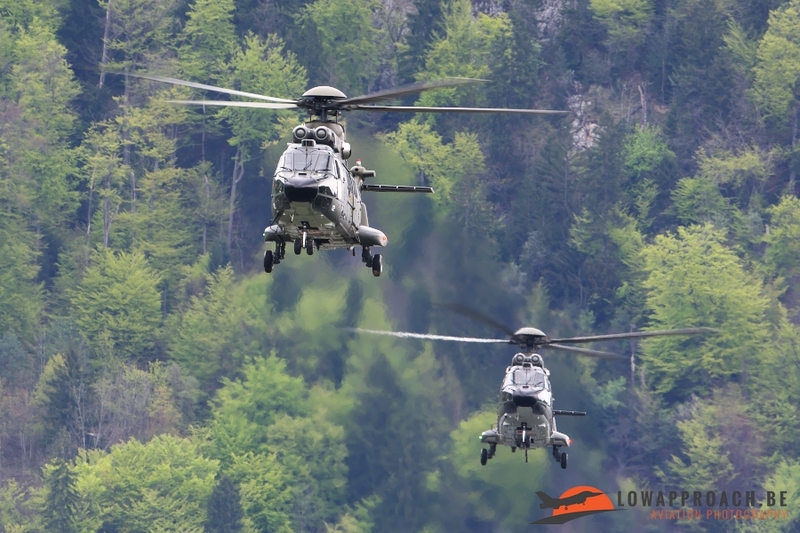 and yes in a distance we could see a formation of three Super Puma’s returning from their mission. 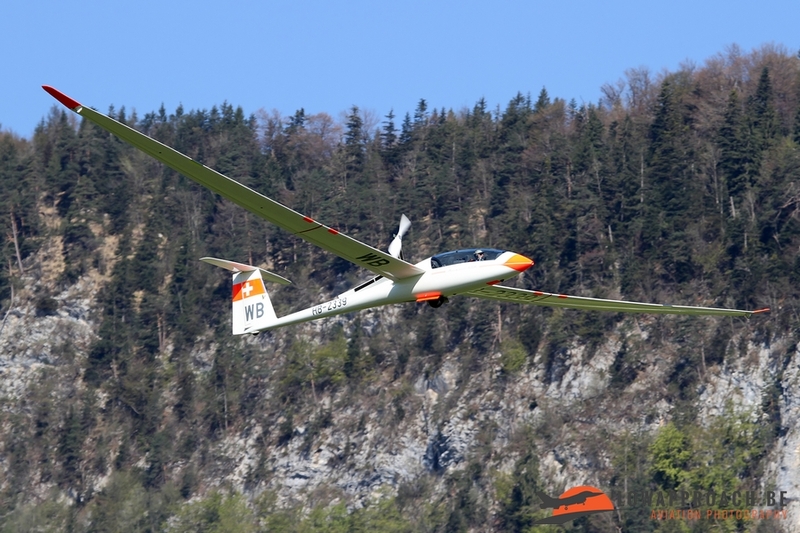 What is nice at the airfield of Alpnach is that they’re passing very close before landing. A better view can be given by the pictures I think. 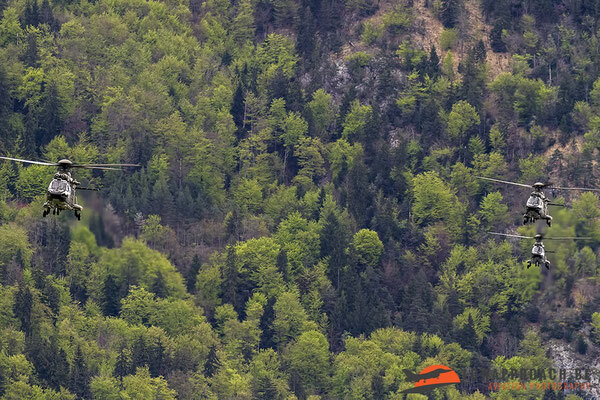 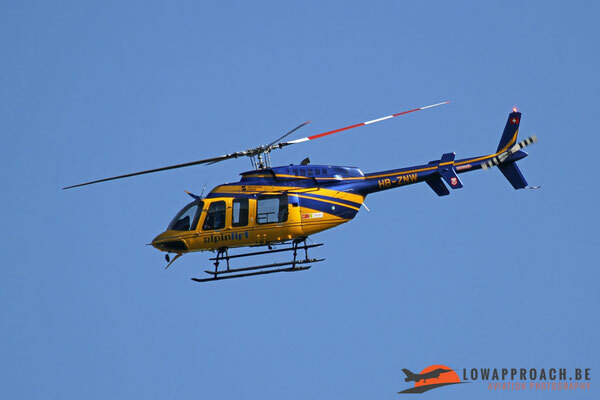 After the landing of these beautiful helicopters we heard something else flying in the neighbourhood and after a couple of minutes we could see an EC635 in the landing. So a couple of hours at Alpnach resulted in 6 Super Puma’s, 3 EC635 and 1 PC-6. 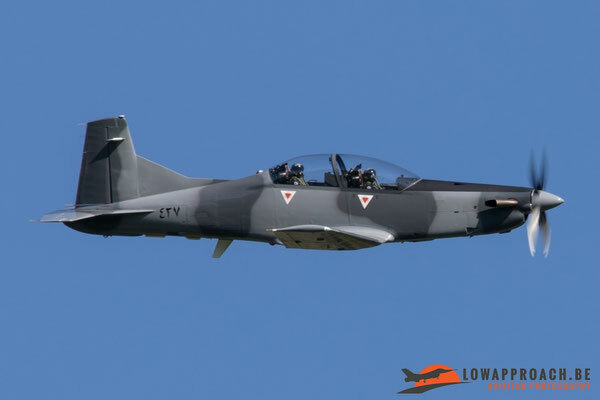 Not bad if you ask me. For the second part of this report we’re going to the Airport of Buochs-Stans: we visited this airport several times during our trip in Switzerland and I must tell you that there is always something nice to see over there. 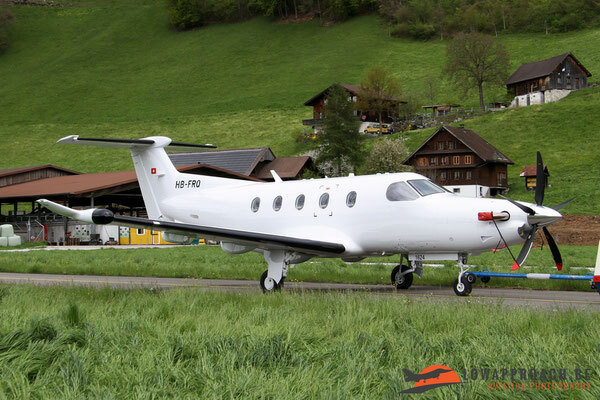 The Buochs Airport is a regional airport in the town of Buochs in the Canton of Nidwalden in Switzerland. 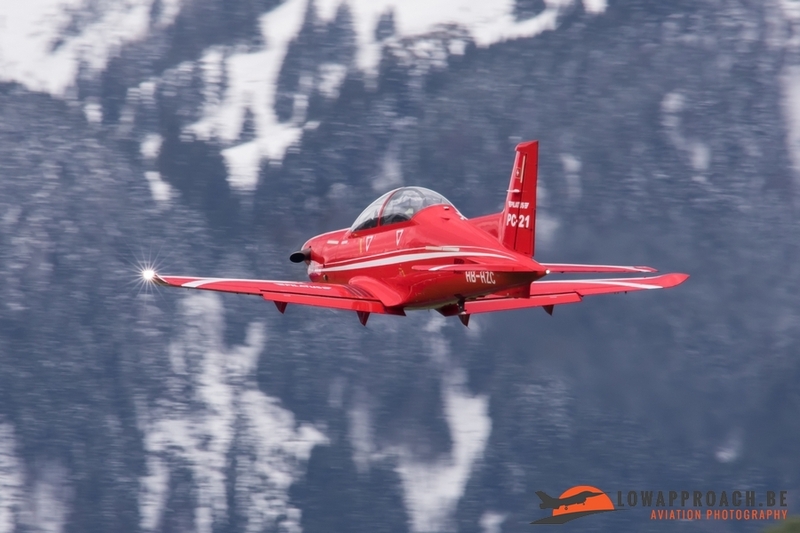 The airfield is formally the responsibility of the Swiss Air Force, but is operated by the Civil Airport Buochs AG. 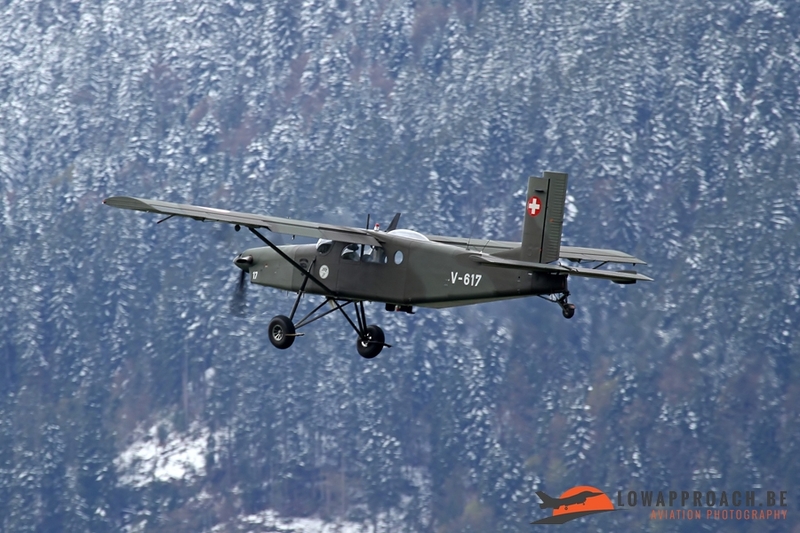 Since 1 January 2004, the military airfield Buochs is a "sleeping base" of the Air Force. 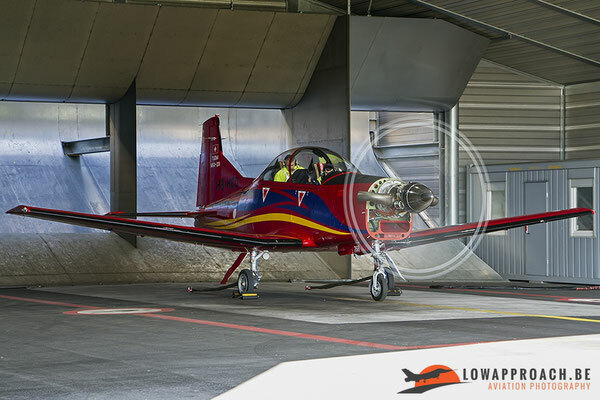 In case of an extraordinary situation the entire military infrastructure of the airfield can be made operational again. Next to the airport is the factory of Pilatus who use the airfield for test flights. And just that is the reason for our visits to this airfield. 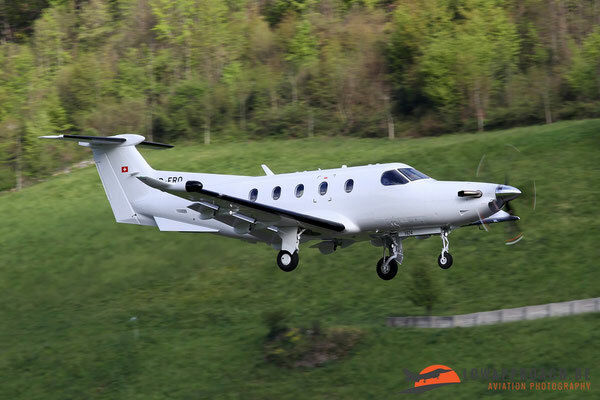 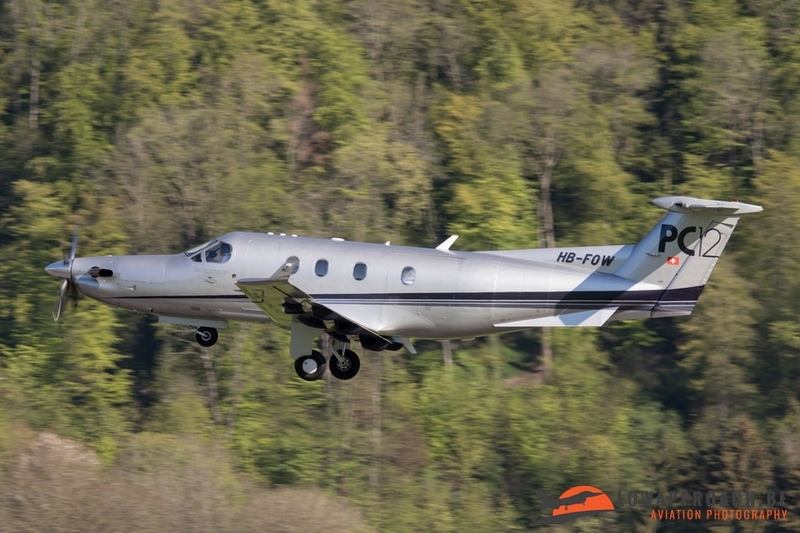 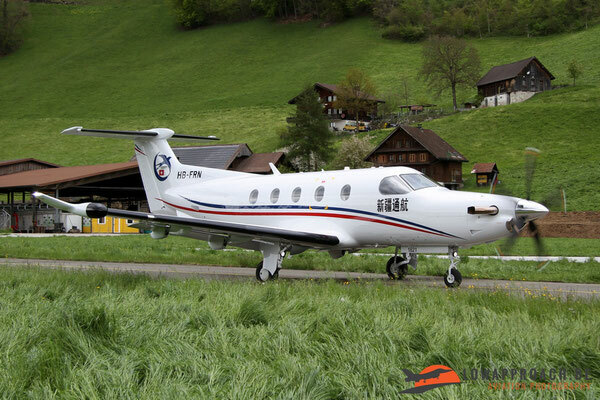 The first short visit was on the 26th April, by arrival we saw the PC-21 test airplane from Pilatus and some PC-12’s outside on the platform. 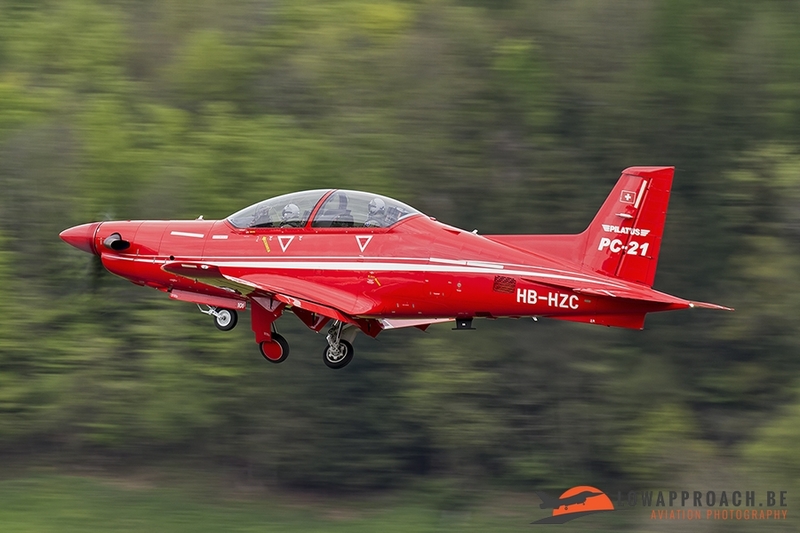 After some waiting we saw the PC-21 starting up. 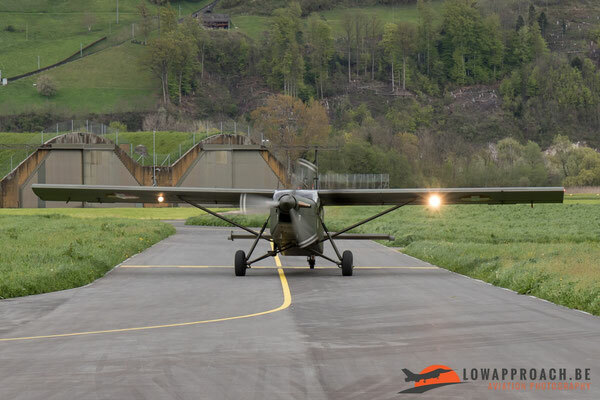 So we decided to go the runway for take-off shots. 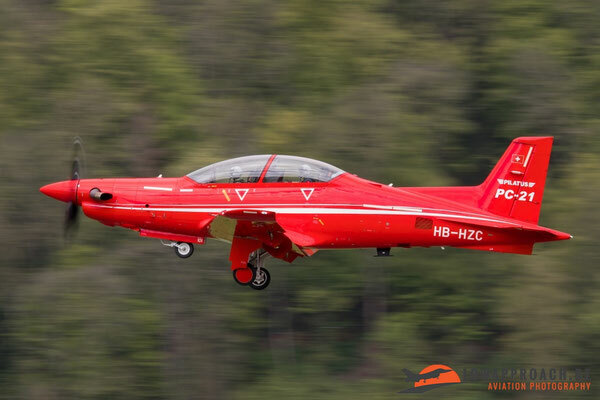 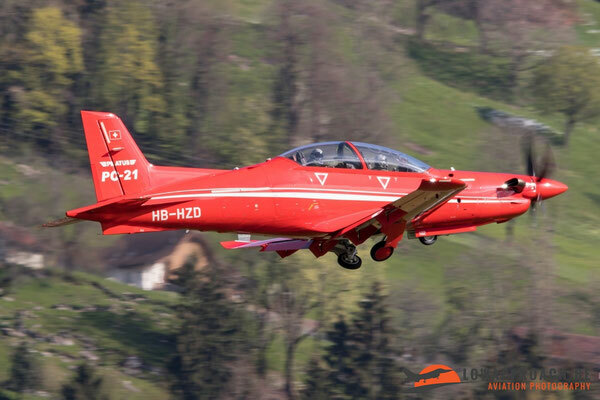 We noticed during take-off that an Australian Pilot sat in the front seat from the PC-21, which isn’t an abnormal sight now that the Australian Air Force has ordered 49 PC-21’s. Also seen were two PC-12, the first with serial HB-FRQ only made an engine test and is at this moment already delivered somewhere in de U.S.A. The second was the HB-FRN who did a test flight. 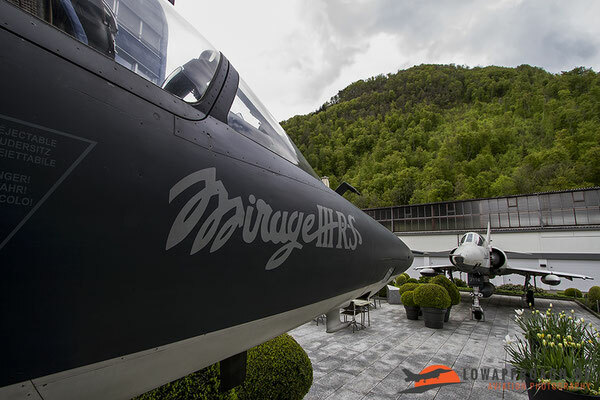 When we left the airfield, we made a little detour before heading back to our hotel and visited Brasserie “Le Mirage” in Stans. Two Mirage’s III RS are standing in front of the brasserie, what a nice view of two very beautiful planes. 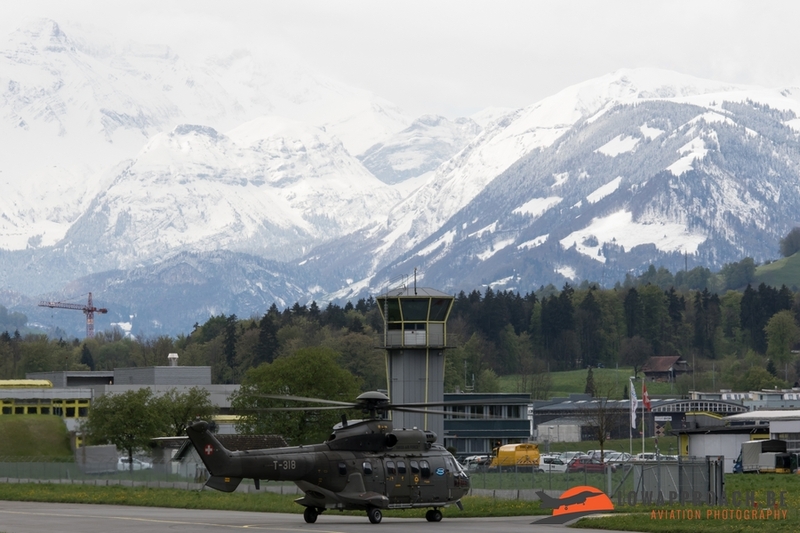 Two days later we visited the airport for the second time, by arrival not much could be seen. 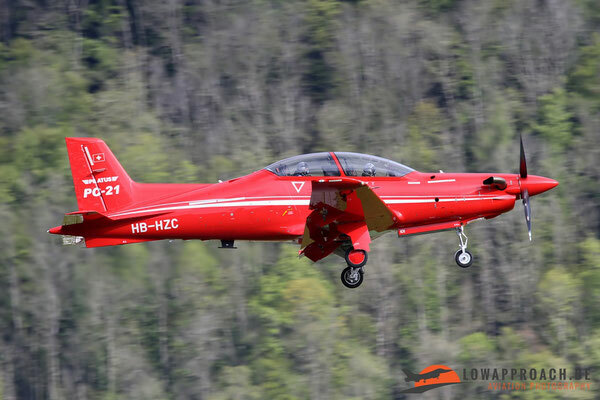 On the platform before the big hall stood just one PC-12 and on another platform two PC-21 testplanes from Pilatus could be seen. 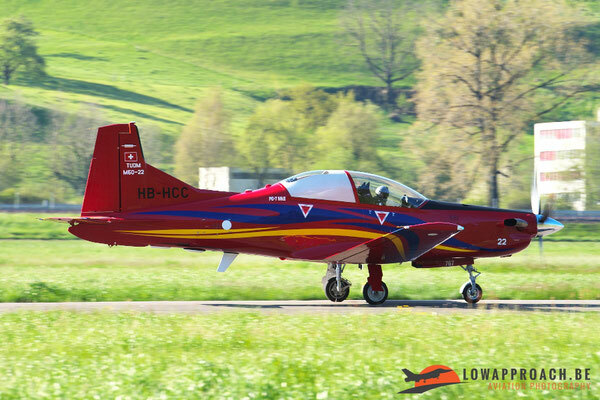 We just got out of the car and the first PC-21 was already starting up so back in the car and a quick ride to the runway for catching the take-off. 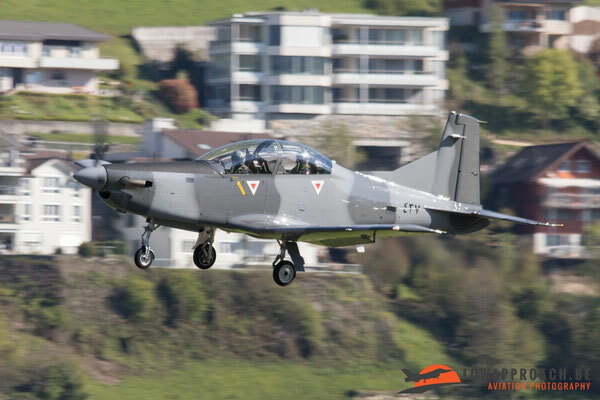 After take-off it was back quiet so we decided to go back to the platform and wait there a while, during our ride back we noticed a PC-9M from the Royal Air Force of Oman. 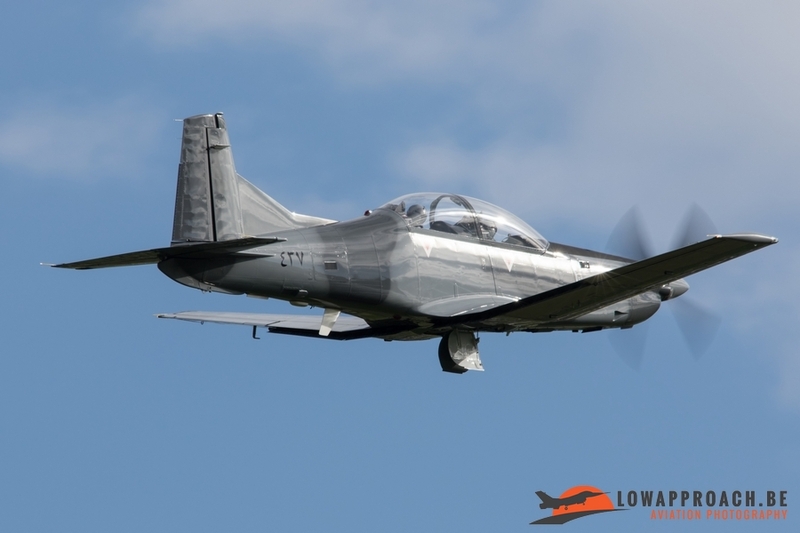 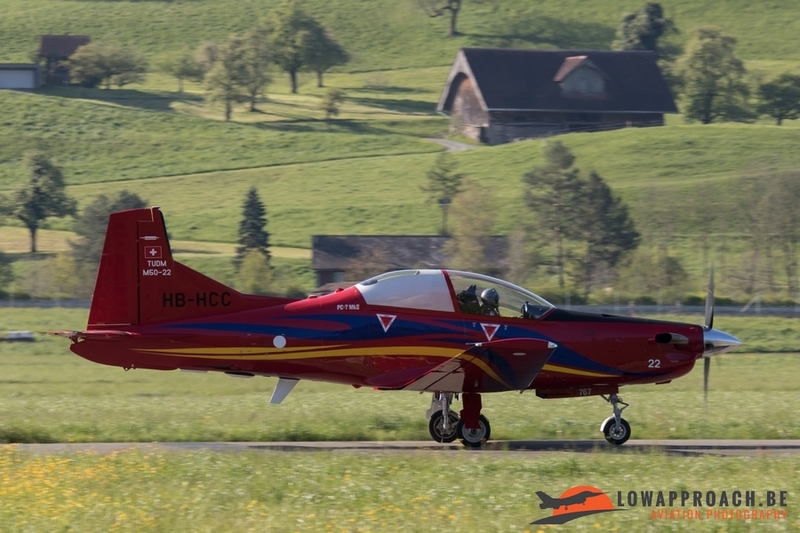 After a little wait pilots were going to the PC-9 for a test flight after maintenance. 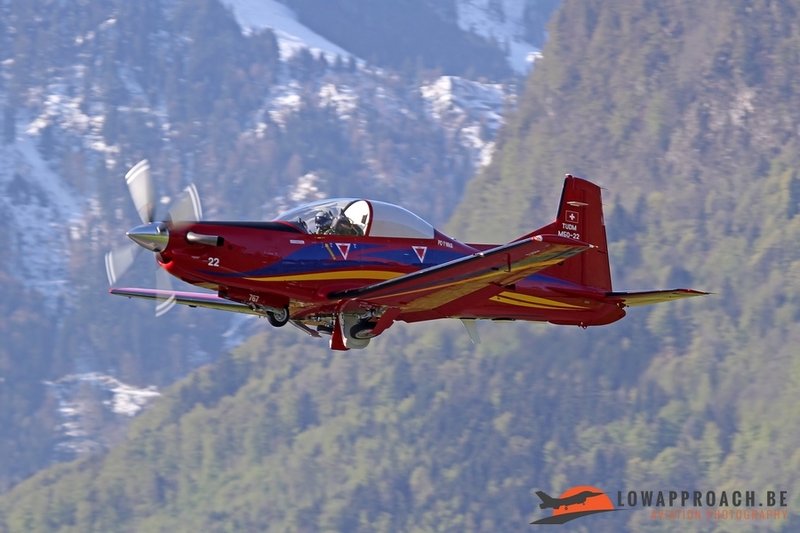 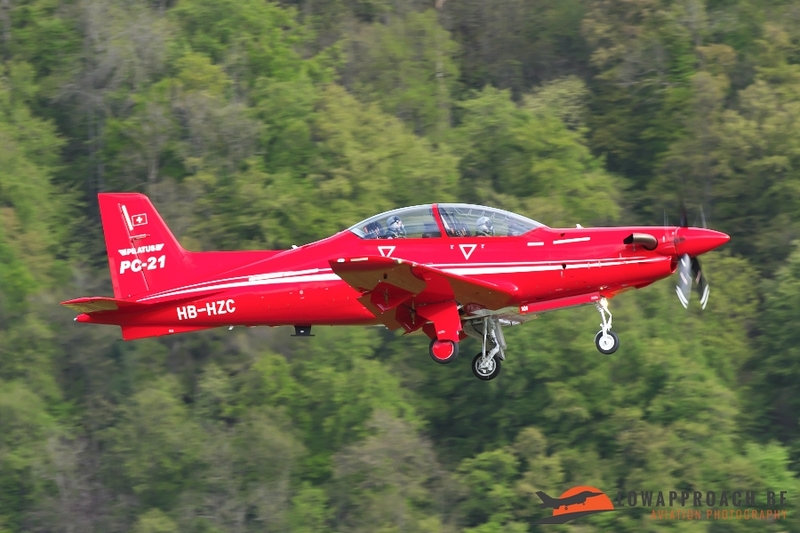 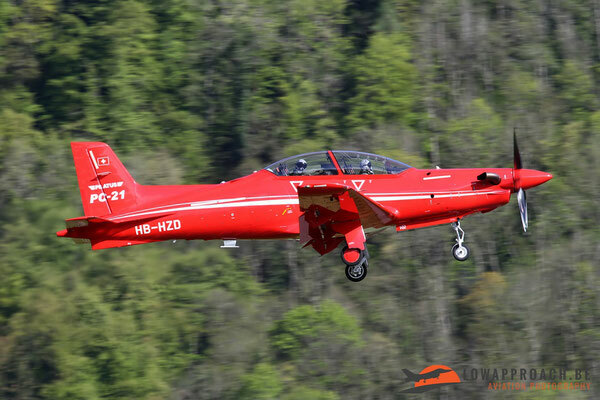 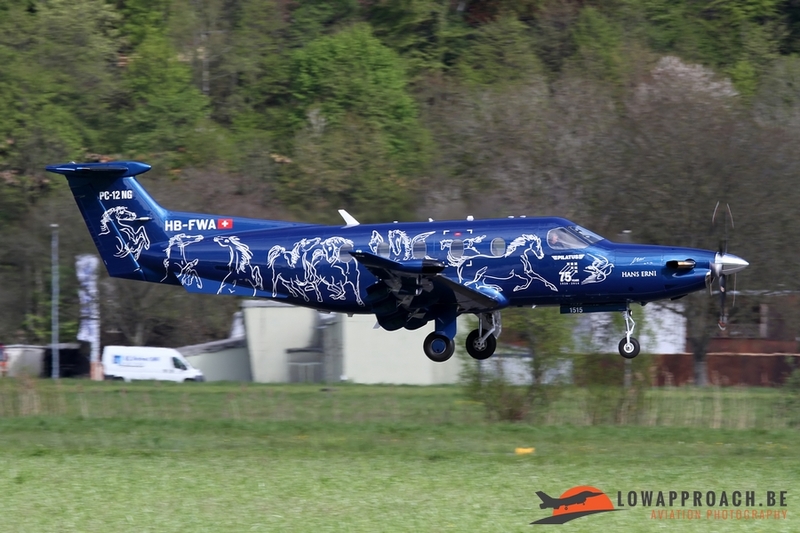 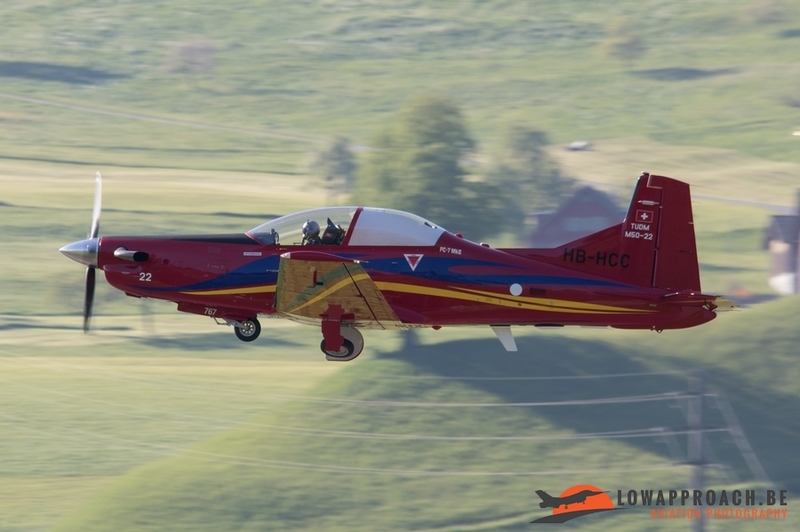 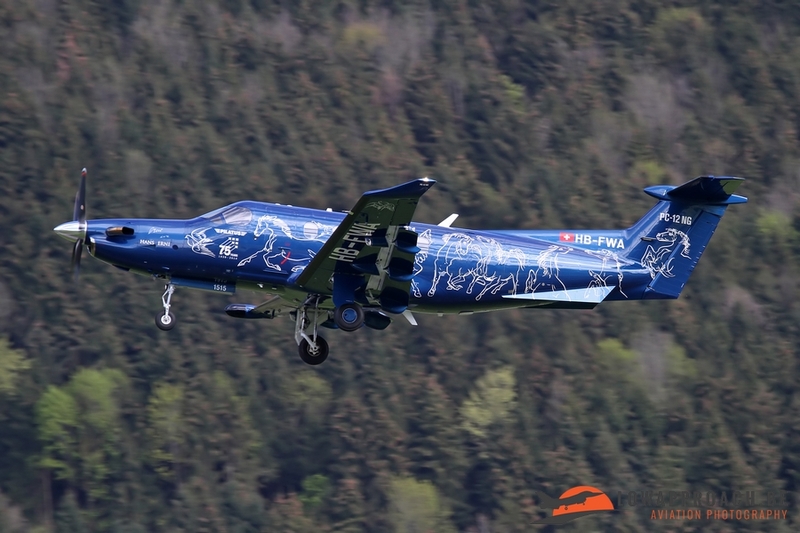 This was a really nice bonus for us, also the second PC-21 from Pilatus left for a flight as well the colorful PC-12. The following day we decided to go to Buochs for the last time this week. 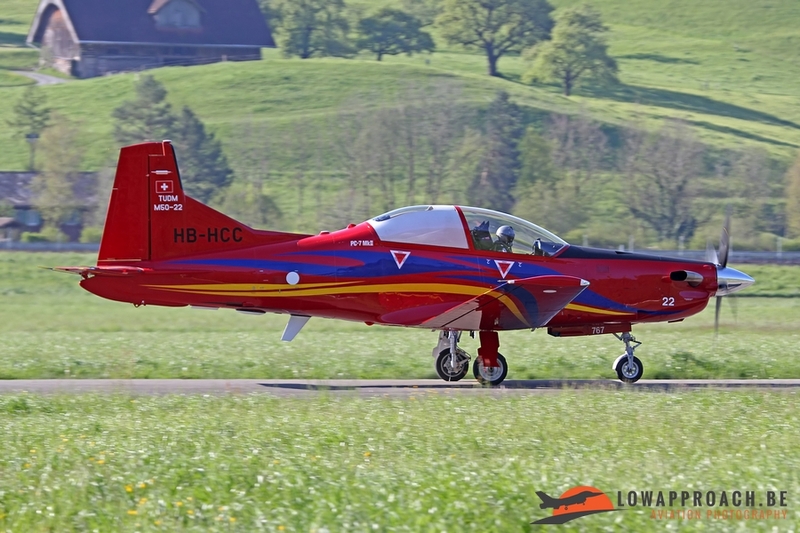 Just arrived and already an Malaysian Air Force PC-7MKII was undergoing an engine test. 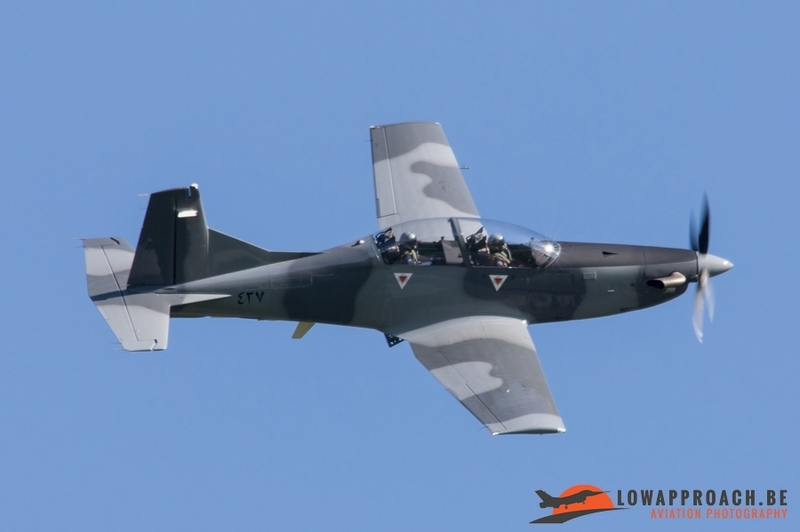 We also heard something in the air and after a few minutes there appeared a plane on final, another PC-7 from the Royal Malaysian Air Force. 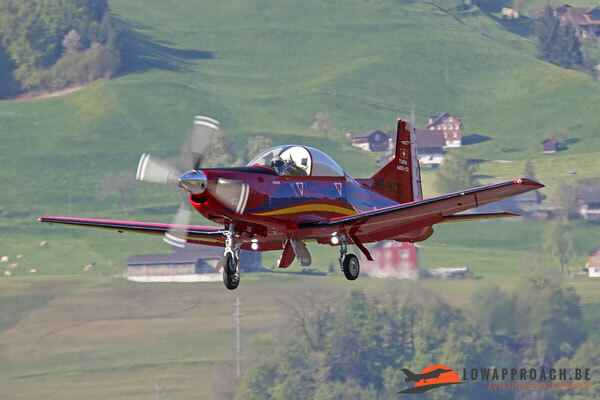 A fast drive to the runway to catch this nice plane. 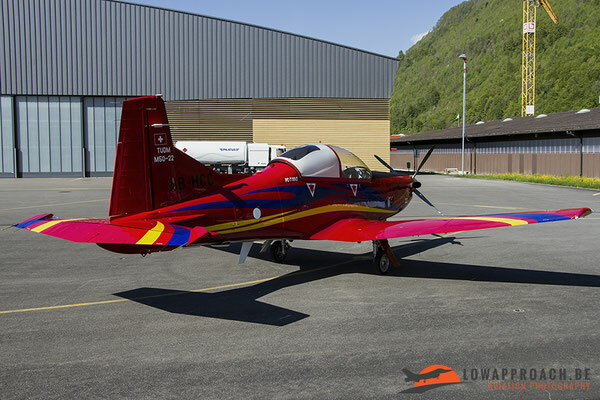 Luckily for us it made two touch and go’s before landing, nevertheless with the sun in front of us because we couldn’t made it to the other side of the runway because the barriers were already down. 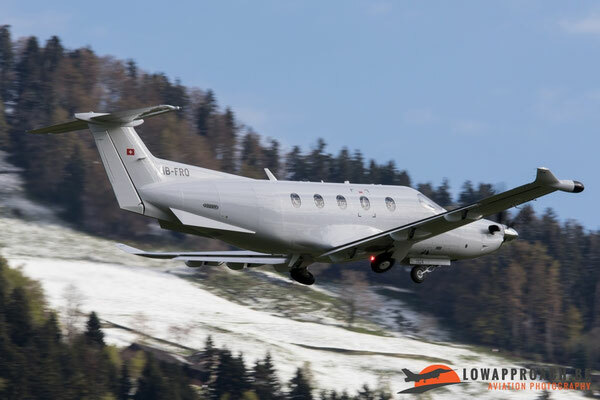 Also on this day we saw an PC-12 for a test flight and a Bell 407GX of Alpinlift Helikopter AG passing crossing the airfield. This was the last report from a fantastic week in Switzerland with a lot of laughs and fun. Thanks this time to everyone involved for making this a unforgettable week. Maybe in a couple of years we will visit Switzerland again for hopefully another great trip.